Join us for a discussion about heart disease and the silliest, most bizarre animal rights comments. We'll be speaking with activists (almost) live on the scene at the annual Animal Rights Day event. We'll also be interviewing Nicole Forsyth, President and CEO of UAN about their My Dog is Cool campaign. Second Nature: The Inner Lives of Animals, and Animal Rights Day in Vancouver! In this episode, Alison discusses animal sentience as presented in the book "Animals as Persons: Essays on the Abolition of Animal Exploitation", by Gary Francione. Joanne interviews Sandra Mohr from a new organiztion FreeAnimalVideos.org and Robert Light discusses the dirty politics behind the Vancouver Aquarium and the Park Board. Animal Freedom Day, and an end to dolphins and whales in captivity at the Vancouver Aquarium? In this episode, Alison spoke about the pending vote to lift the international whaling moratorium. Joanne spoke about "humane" meat, milk and eggs. 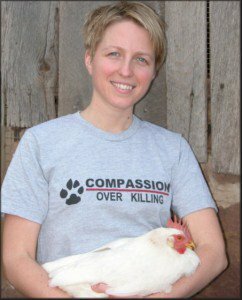 We interviewed Erica Meier from Compassion Over Killing about the Cal-Cruz Hatcheries investigation and Leanne Cronquist from Farm Sanctuary about the ducklings seized from the investigation.